crisis communication – Wheeler Blogs. It’s been nearly a month since Klout infamously changed its scoring algorithm to “A More Accurate, Transparent Klout Score.” I’ll admit, I was a little disheartened when my score dropped 16 points after months of hard work tweeting my Klout score up to a cool 65. Nearly a month later now and I don’t even know what my score is. I’ve been tweeting less frequently and none of my other social networks ever seemed to matter in Klout’s scoring system anyway so I would imagine my score is somewhere in the low 40s. Fine. I don’t really care anymore. However, I do want to talk about how poorly Klout handled the social media firestorm that came immediately after the change. For the most part, the dust has settled and users have put the issue to rest. However, the day Klout made the changes, the social media world erupted. When I noticed my score dropped it was already well into the evening. I went to Twitter to see what was going on and, sure enough, it seemed like everyone was complaining about the new changes. In a social media crisis, it's hard to reply to everyone, but replying with the same non-personal stock answer is not the way to go. 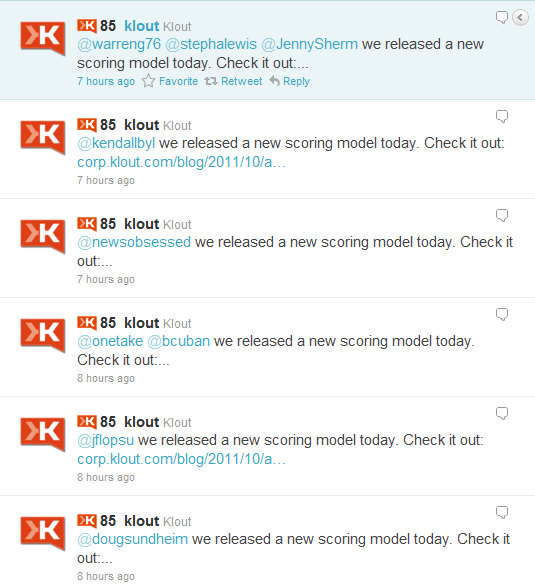 To Klout’s credit, they were trying their best to reply to everyone’s concerns. However, replying to everyone who has negative comments on the subject with the same stock answer will make your brand come off as inhuman and lazy. In my opinion, if a brand is hit with this many negative comments on the same issue, it is best to reply with personalized responses for each case. If there is not a way to respond in a personable, positive manner, then not responding at all might be the next best thing. Managing hundreds if not thousands of negative comments on one social media platform might prove to be a difficult if not impossible task. Soon after Klout’s scoring algorithm changed, many ‘influencers’ suggested users delete their Klout profile altogether–the most notable being Rohn Jay Miller’s article on socialmediatoday.com. This is where Klout’s bigger crisis communication issue comes in to play–Klout has disabled the option to delete your profile! This is a huge issue regarding the integrity of a company and proves Klout is not concerned so much about actually helping people to understand their social influence as it is about getting a huge IPO. Klout has really dug their own hole on this one. I suggest Klout releases a public apology and once again enable users to easily delete their account. There have been a number of social media crisis in the past from major brands–the most well known being Nestle’s Greenpeace video censorship, Dominoes viral video of employees violating health codes and the ever-popular United Airlines Breaks Guitars YouTube video (now over 11 million views). A company making a mistake is what keeps them human. How they handle negative sentiment after making a mistake is what keeps them human.